Little wonder this phrase has become a popular meme in recent years; it can convey exactly the sort of self-satisfaction and superiority that express themselves so often and so malignantly on the internet. 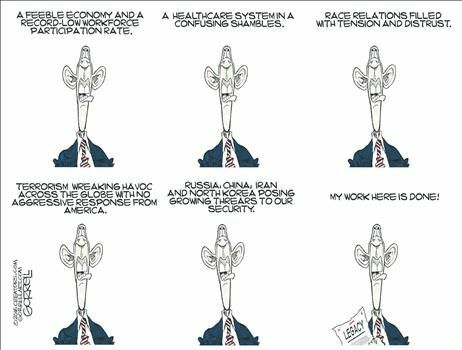 Of late it has become popular in right-wing circles as a means of bashing Obama — they never tire of it — as in this cartoon. It doesn’t have to be this way. The phrase can have a benevolent sound, the sort of thing Gandalf or Obi wan Kenobi might say, though as far as I know neither of them ever did. But juvenile irony is winning the day; now the expression goes readily with scenes of catastrophe and chaos. Most on-line sources cite three possible sources of the catchphrase: the Lone Ranger, Mary Poppins, and Blazing Saddles. I’ve been able to verify only the last, not the other two. Some cite Errol Flynn in The Mark of Zorro (1940). “My work is done here” is a variant (used by Leonard Nimoy in the monorail episode of The Simpsons, for example); it means the same thing and has the same weight. This formulation is technically ambiguous, but the alternate meaning (I do my job in this place) does not obtrude. “My work here is done” began to appear sporadically in LexisNexis right after 1990. Then as now, it was a favorite of departing CEO’s who wish to convey the impression that they have completed their stint with honor and can safely hand responsibility to their successor, provided they get their severance package. Perhaps that’s when the phrase picked up its odor of smugness. Despite, or because of, the ironic turn, it still bears a hint of hipness and remains the property of college kids, middle-aged columnists, and corporate consultants alike. But the question is not “When did this expression originate?,” because the phrase is not fixed, and any normally equipped English speaker could utter it in the course of conversation. It’s an ordinary English sentence, after all, and doesn’t require a mythical origin. True, it is a bit more elaborate than what you might call the ground-level expression, “My work is done,” which has an almost Biblical simplicity. The question is when did it become the sort of thing people ask about in chat rooms and forums? According to LexisNexis, it started turning up regularly in the press not long after 2000. It might be used to end an article, or, conversely, as a blogger’s headline. As early as 2004, I found an example of the now familiar meme: “Chaos, panic, disorder — my work here is done.” (Google it and despair.) The phrase has always had a bias toward the smug, but now it has a healthy dose of snark as well, as we use it to crow about the mess we (or someone else) have made rather than acknowledge an edifying experience. The expression’s grandiloquence is real but easily subverted. The trend toward using it sarcastically continues and may win entirely in another ten or twenty years.